The leader of the Roman Catholic Church in England and Wales has brushed off any concerns that there is a lack of enthusiasm for the Pope's visit. Archbishop Vincent Nichols said he was sure "Catholics are looking forward to this visit very much indeed". The archbishop's comments came after it was revealed that thousands of tickets remained unsold for events during the visit of Pope Benedict XVI to the UK. David Cameron said he was offering the Pope a "very warm welcome." The prime minister added that Pope Benedict's four-day stay, the first ever state visit to the UK by a pope, was "incredibly important and historic". "These will be a very special four days not just for our six million Catholics, but for many people of faith right across Britain, and millions more watching around the world. "Of course, not everyone will agree with everything the Pope says, but that shouldn't prevent us from acknowledging that the Pope's broader message can help challenge us to ask searching questions about our society and how we treat ourselves and each other." 19 September: Beatification Mass at Cofton Park Birmingham; Meets bishops of England, Scotland and Wales; Leaves for Rome. The largest organised event during the Pope's visit to England and Scotland is an open-air Mass at Bellahouston Park in Glasgow on the opening day of Pope Benedict XVI's trip to the UK. The capacity has been reduced to 80,000 after a slow take-up of tickets. Dioceses in England and Wales have also reported thousands of unfilled places for a London vigil, and the service to beatify Cardinal Newman in Birmingham. The archbishop added: "The Catholic tradition in this country is one of actually very profound loyalty to the person of the Holy Father. "While many would want to suggest differences of trends and opinion, this way or not, I'm quite sure - and it is my experience at parish after parish, and standing at the back of Westminster Cathedral day after day - that Catholics are looking forward to this visit very much indeed. 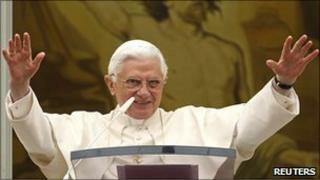 "And the Catholic people of this country know what it is to show their affection and support for Pope Benedict." Jack Valero, who is co-ordinating the beatification of 19th Century English cardinal John Henry Newman in Cofton Park on Sunday, said: "It is still not as many as expected, although it's pretty full." Archbishop Nichols said he expected 54,000 to 55,000 people to attend the 60,000-capacity event, which requires a "pilgrim pack" costing up to £25 for entry. The London vigil takes place in Hyde Park on Saturday. BBC religious affairs correspondent Robert Pigott says the relatively slow uptake of passes for the big events appears to indicate less enthusiasm among Catholics to see Pope Benedict than they showed for his charismatic predecessor John Paul II 28 years ago. Pope Benedict's visit has already sparked controversy over its cost and relevance. The cost of policing the trip will be up to £1.5m, the Association of Chief Police Officers has estimated. Lord Patten, the prime minister's representative for Pope Benedict's visit to the UK, reaffirmed that the total cost of the Pope's stay to the taxpayer would be between £10m and £12m. The Catholic Church is also expected to make a contribution of between £9m and £10m towards the costs. He added that the British people would be "pleased to know" that the visit would cost less than half of one day of last year's G20 meeting. A BBC poll ahead of the Pope's arrival found almost six-in-10 British Catholics asked said their faith was not "generally valued" in British society, but 70% expected the visit to help the Catholic Church in the UK.